Ceramic tile is becoming more and more popular. The durability and ease of maintenance makes it perfect for families on the go. 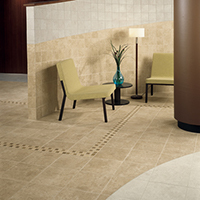 Ceramic tile is and environmentally safe and natural choice of flooring. Ceramic tile contains raw materials that come from the earth, including the colors of the glaze. Ceramic tile - A mixture of clays, which have been shaped and fired at high temperatures result in a hard body that may then be left untreated or, it may receive a glazed wear layer. Ceramic tile is nothing more than a beautiful piece of clay. Decorating with ceramic tile can be fun whether you're doing a whole room, a kitchen backsplash, tub surround, or your counter top. We at Joseph's Flooring we will be happy to assist you in creating the decor you've envisioned or assist you with designing a look that we feel would add that special touch to your home. Our Flooring Network tile choices come in a variety of shades and colors which will allow you to create a decorative scheme suited just for you. We are proud to carry such highly reputable ceramic tile lines as American Olean®, Dal Tile®, Florida Tile®, Benissimo®, Florim®, Impronta Italgraniti®, Interceramic®, Marazzi®, MS International Stone Products®, Ragno®, Sheldon Slate®, StoneXpress®, Vitromex® and others. Nothing quite emphasizes beauty like Ceramic Tile Flooring. It's unmatched durability will prove to provide years of life, long before bearing the first indication of it's age. We have all the styles, sizes and patterns to suit your existing space and décor and, as always, the best ceramic installers in their field. So if you have been considering a gorgeous ceramic tile floor for your living space, look no further. As with any flooring, you will want to choose a color and design that will coordinate with other items in your room. Choose a color that will compliment the style of your room. Lighter colors will make room feel more open, while darker colors will make the room feel small. A lot of that depends on how much lighting you have in your room. So you’ll want to take into consideration the amount of natural light coming in from windows as well as, artificial light. Something else that has changed over the years is what size tile to go with. It used to be that if you were tiling a small room you would use a small tile (i.e. 6x6, 8x8). You can still do that of course, it’s a preference. Keep in mind though if you do go with a small tile on the floor you will not want to have wallpaper with a small print on it because then it may make your bathroom look busy. People are now actually putting a 12x12 or 13x13 tile in to rooms as small as 4x6. The trick is to install it on a diagonal. Installing tile on a diagonal makes the room appear more open. Installing tile on a diagonal typically cost a little more in labor and uses approx 5% more waste than the traditional way, but it is well worth it. Then again if you are installing it yourself the labor cost doesn’t matter.